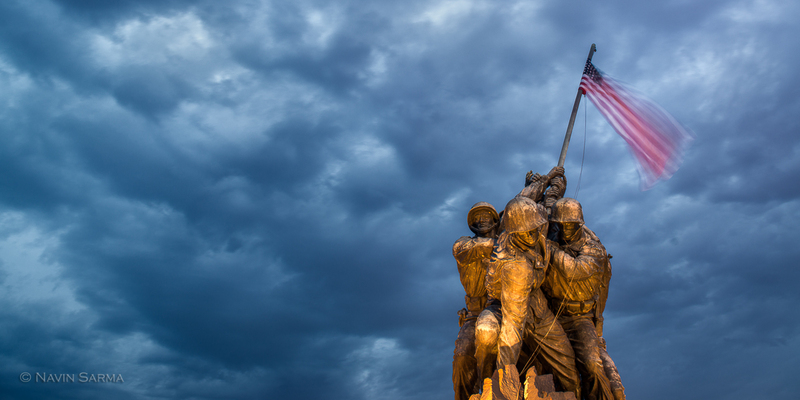 Yesterday, I kicked off my summer bootcamp of 16 washington dc landscape and nature photography classes at the Iwo Jima Memorial (otherwise known as the U.S. Marine Corps Memorial). We had a great group of motivated participants and after a slightly uneventful afternoon of light, were treated again by the post-sunset city glow that graces our city and adds drama to the sky. Especially when there are low clouds hanging around, the faint sunlight mixed in with city lights creates a purple and pink glow right above the city. It slowly creeps across the sky from East to West. Although it is a result of some haze in the sky mixed in with “light pollution”, it is still quite a beautiful sight to behold and photograph. 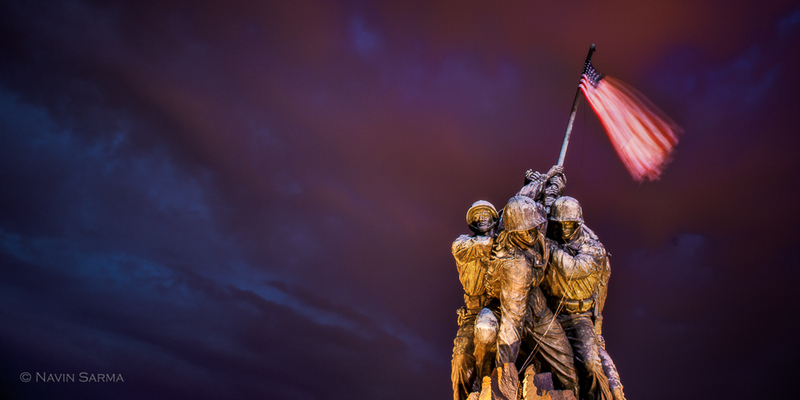 I think all of us were happy to try to feature that pink light above the Iwo Jima Memorial. The transition between sunset and post-sunset light, especially around the city, can be dramatic. Case in point: check out these two images from the same vantage point, the first taken at 7:56pm and the other at 8:15pm. What a difference 20 min can make! If you are interested in signing up for the bootcamp, please see details on my website or Meetup page. I think remaining spots will fill quickly!